Joseph Caruana was born in Żejtun in 1951. At an early age, he showed a deep interest in music, particularly in organ music, however he did not receive any formal training until the age of 19. He started learning the piano under maestro Rev. Michael D’Amato, and in 1975 he passed the final examination Grade VIII of the Associated Board. In the same year he started organ studies under Fr. Karm Scerri, at the time organist of St. John’s Co-Cathedral. Concurrently he studied harmony under Maestro Charles Zammit. In 1979 he obtained the final Diploma of the Associated Board of Music Studies in organ studies. At the age of 29 he qualified for the L.T.C.L., practical part, and organ. In 1986, Caruana won a French government scholarship to study organ music at the Lille Conservatory, under the direction of Philip Lefebvre, organist at Notre Dame, and Jean Buayer. In 1990, when Pope John Paul II visited Malta, Joseph was chosen to accompany the choirs taking part in the Pontifical Mass held at the Granaries, Floriana. In July 1991, he was awarded another scholarship in Sicily, where he studied Gregorian chant and voice modulation under Bruno Zagni, Marika Rizzo and Nino Albarosa. In that same year he represented Malta at the 5th International Organ Congress in Trecastagne in Sicily under the direction of Arturo Sacchetti. Joseph Caruana is at present the organist and choir-master of St. Catherine’s Parish Church in Zejtun. 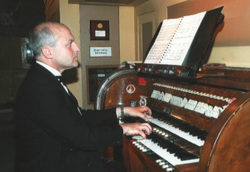 He has participated in several major concerts, both as a soloist and as accompanist, earning a solid reputation as one of Malta’s leading organists.